GOD CREATED MAN THE HUNTER (Hard cover with dust jacket. Collector's copy, limited edition, numbered and signed). This is the first book in the Big Game Hunting memoir series. STAND YOUR GROUND (Hard cover with dust jacket. Collector's copy, limited edition, numbered and signed). This is the second book in the Big Game Hunting Memoir series. IN THE SHADOW OF NYAMINYAMI (Hard cover with dust jacket. Collector's copy, limited edition, numbered and signed). This is the third book in the Big Game Hunting Memoir series. BLACK RHINO (Hard cover with dust jacket. Collector's copy, limited edition, numbered and signed). This is the fourth book in the Big Game Hunting Memoir series. This is the fifth book in the Big Game Hunting Memoir series. GAME RANGERS AT WAR (Hard cover with dust jacket. Collector’s copy, limited edition, numbered and signed). This is the sixth and last book in the Big Game Hunting Memoir series. This book was awarded five international wildlife conservation awards. The state of wildlife in Africa at the start of the third millennium. (Available from Ron Thomson Publications ONLY @ R 300). Insured parcel SURFACE postage (within South Africa) Nos. 1 to 8 & 14 - R 50. Insured parcel AIRMAIL postage (Africa outside South Africa) Nos. 1 to 8 & 14 - R 200. Insured parcel AIRMAIL postage (International) Nos. 1 to 8 & 14 - R 380. Surface mail postage within South Africa. No. 9. - FREE. AIRMAIL postage world-wide. No. 9. - R 25. Customers in America requiring “THE ADVENTURES OF SHADREK” are advised to obtain their copies of THIS book from Safari Press in California. 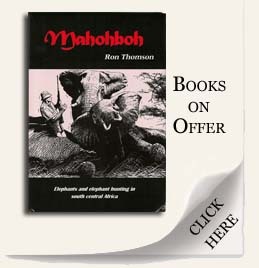 ALL BOOKS PURCHASED FROM RON THOMSON PUBLICATIONS WILL BE SIGNED BY THE AUTHOR.